Improved Conversion Rates… yes, that’s all we want! We all try our level best to increase those sluggish sales. Do you know the design of a website also plays an imperative role as it helps to achieve higher conversion rate? In this article, we are going to talk about the main elements of website designing and concepts that magnetize visitors and encourage them to buy your products/services. A simple design can easily win hearts. On the contrary, a complex design distracts people and takes them away from Call-to-Action (CTA). Clear design can keep your visitors focused and persuade them to buy the products. Secondly, remove visual disruptions and too many navigational elements. Review the colors of your website. Excessive use of colors keeps your visitors away. You need to use the right blend of colors at the right places. Also, when considering the colors on different web pages, carefully check the colors of the background, font colors, and accent colors. What is the most important thing that the visitors need to know about your services or products? Information, yes, you’re right. This info must be placed above the fold and in a crystal clear manner. With this, your customers will be able to see the information before scrolling down the page. This makes sure that your clients will get the details they want to see right in front of their eyes to keep them on the specific page. Lastly, this website designing trick also encourages visitors to stay longer on the website. Poor navigation is also a main reason that compels people to leave your website. Navigation should be clutter-free and easy-to-understand for users. You can do this by highlighting the important things in the most visible spots while the less important should be set at the bottom. Easy navigation helps people to explore your website in a stress-free way. For this, you can use drop down menus to put a stop in crowded links. Secondly, the menu bar should be clearly visible, so users can have a good idea of using your website. An enticing and high-quality logo improves the overall design and builds trust. The brand logo signifies the presence of your company in the online world. The brand logo should be placed in such a way so that it can easily and quickly pull the eyes of visitors in an effective way without distracting their attention from the main content. Moreover, include accreditations and certifications (if you have any) as this will prove your genuineness to visitors. Like other elements, white space is a vital part of web design. Lack of white space gives your website a cluttered appearance. So, you need to ensure that your website design has a good amount of white space. When a website is messy, visitors are more likely to go away without buying anything. Thus, keep your website simple with the right use of white space and let those conversions go up. For each and every step you want your visitors to take, there should be a procedure and that must be very simple. Yes, the simpler it will be, the better it will be for your sales graph. 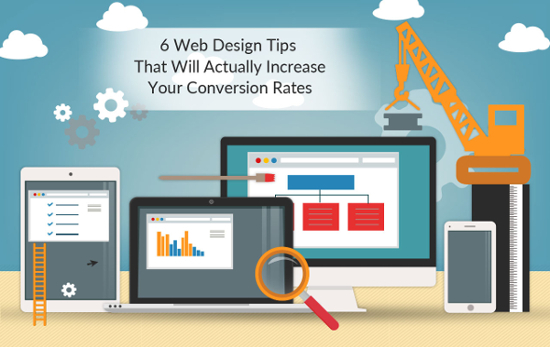 So, follow these web designing tips and achieve those brow-raising conversion rates without breaking your back.